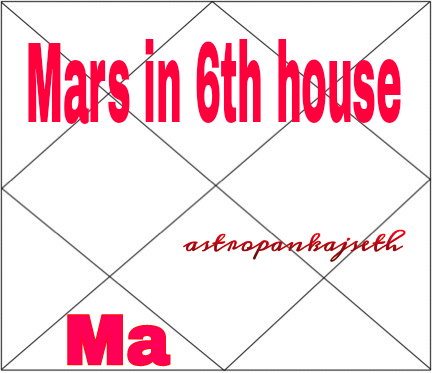 1)Before knowing effect of Mars In 6th house we have to know about Mars and 6th house. 2)Mars in 6th house is consider good. Mars is natural karak of strength when Mars is occupy 6th house, native may get full strength. Native may be very brave,energetic and man with action. Native may be argumentative and quarrelsome. 3)6th house is house for enemy when Mars is occupy 6th house, native has power to get victory over enemy. Native may crush all his enemy or competitors. According to classical a strong Mars in 6th house makes native as a King. In current time a strong Mars in 6th house gives native to power, authority, position. 4)6th house belongs to disease when Mars is well placed in 6th house then it is indicating native may be free from disease. Native has good digestive fire which helps native to enjoying disease free life. If Mars is afflicted then it may be indication of accidents. Nature of accidents depending on planet’s significant who is associated with Mars such as when afflicted by Venus then may be accidents by vehicle. 5)6th house belongs to debits when Mars occupy 6th house native may be a debit free life.Native doesn’t suffering from debit due to his good financial management. If Mars is weak or afflicted then results may be opposite. Well placed mars in 6th house, native may be wealthy or earn good. 6)6th house belongs to legal matter when Mars is placed in 6th house native may be facing legal problem specially when Mars is afflicted by Saturn. This legal problem may be between Brothers or cousins (Mars belongs to brothers) and problem due to property or land (because Mars rules over Real estate). 7)Mars in 6th house aspects Lagan so it also give impact on body physique so native may be strong and tall body constitutions. 8)Mars in 6th house also aspects 12th house which is indicating native enjoying all materialistic enjoyment of life. If Mars is afflicted then it is indicating native may has sexual disease such as sexual excitement type problem. 9)6th house also a Arth trikona and Mars belongs to Real estate so native may be doing jobs in real estate or business of real estate or earn through real estate. 10)6th house belongs to Service so when Mars occupy 6th house native may be suffering problem through his servant or employees or who work under the native. Because Mars rules argument and when Mars placed in 6th house native may be argument with his servant.